The contact can be transferred from a bluetooth� phone to the system. 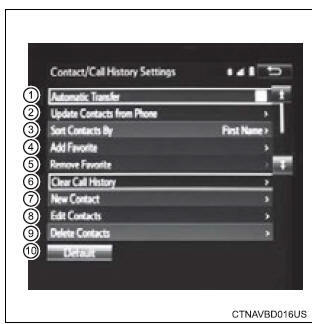 For pbap compatible bluetoothr phones, select to set automatic contact/history transfer on/off. When set to on, the phone's contact data and history are automatically transferred. Select to reset all setup items. *: For pbap compatible bluetoothr phones only, this function is available when "automatic transfer" is set to off.